I don’t know why I watch Rohit Shetty films. I’m more of a Bhansali kind of girl. But, then, we all like an exploding car, don’t we? 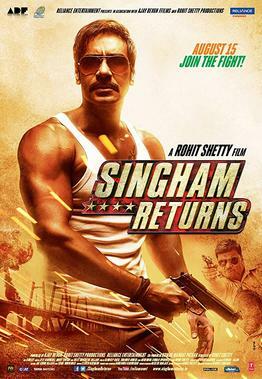 Singham Returns is a film with exploding cars. And shoot-outs. With good guys (who look like Mumbai police) and bad guys (who don’t). I didn’t watch Singham (it probably had some exploding cars) before I watched him return, but I didn’t feel a desperate lack of backstory. Ajay Devgn plays the eponymous hero. He fills out a police uniform and bashes the baddies. He’s also righteously incorruptible (which leads to extra bashing opportunities). I’ve forgotten what actually happens in the film. Other than the exploding cars, the shoot-outs, the bashing, the baddies and the goodies. I reckon Rohit wouldn’t mind. Oh, there’s Kareena Kapoor. She’s the usual Kareena Kapoor, having long chucked in the suspension of disbelief lark. Except, she seems kind of lighter, paler … bored, perhaps. Or it could be that there is now a Kareena Kapoor hologram, and, like Margaret Atwood signing autographs, she just beams herself in to provide some brief outrageous excitement while really staying at home in her dressing gown. It’s not that I didn’t enjoy the film, it’s just … it’s a Rohit Shetty film. Collect them all. Now, the final question is: how does Singham fit into the canon of khaki-clad, aviator shade-wearing, scenery smashing filmi heroes?